Most Microcontrollers have more than just a CPU, RAM, or Flash Memory - they contain sections of silicon which are used for interacting with systems outside of the microcontroller, as well as directly and indirectly interacting with their surroundings in the world via sensors, motor controllers, or human interfaces such as a display or keyboard. These components are collectively known as Peripherals. These peripherals are useful because they allow a developer to offload processing to them, avoiding having to handle everything in software. Similar to how a desktop developer would offload graphics processing to a video card, embedded developers can offload some tasks to peripherals allowing the CPU to spend its time doing something else important, or doing nothing in order to save power. The RAM chip, ROM chip and I/O controller (the peripheral in this system) would be joined to the processor through a series of parallel traces known as a 'bus'. 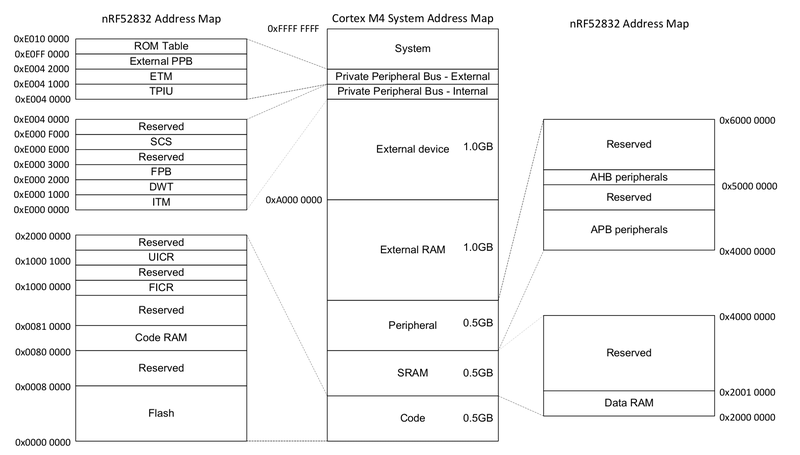 This bus carries address information, which selects which device on the bus the processor wishes to communicate with, and a data bus which carries the actual data. In our embedded microcontrollers, the same principles apply - it's just that everything is packed on to a single piece of silicon. However, unlike graphics cards, which typically have a Software API like Vulkan, Metal, or OpenGL, peripherals are exposed to our Microcontroller with a hardware interface, which is mapped to a chunk of the memory. On a microcontroller, writing some data to some other arbitrary address, such as 0x4000_0000 or 0x0000_0000, may also be a completely valid action. On a desktop system, access to memory is tightly controlled by the MMU, or Memory Management Unit. This component has two major responsibilities: enforcing access permission to sections of memory (preventing one process from reading or modifying the memory of another process); and re-mapping segments of the physical memory to virtual memory ranges used in software. Microcontrollers do not typically have an MMU, and instead only use real physical addresses in software. Interaction with these peripherals is simple at a first glance - write the right data to the correct address. For example, sending a 32 bit word over a serial port could be as direct as writing that 32 bit word to a certain memory address. The Serial Port Peripheral would then take over and send out the data automatically. This interface is how interactions with the hardware are made, no matter what language is used, whether that language is Assembly, C, or Rust.